Among the many toys based on Marvel’s Avengers, the Hulkbuster by LEGO has been a great hit among the Marvel fans who want to collect their memory of the galaxy savers. This LEGO made brick version of the Hulkbuster armor worn by Iron Man in his movies comes with 5 modules featuring posable fingers, rotating torso, hands, legs and 12 elements that glow in the dark in the package. This also has a punching feature with jackhammer arm. You can just activate the lights in the body using a button making it suitable for anybody older than 14 years. The color and finish of the body are outstanding. Another major feature of this enjoyable build is its platform that features an information plate with 8 other attachment points also a desk with the attached computer screen with space to build and launch the Veronica and hotrod car. We can easily clip the spare arm to the robotic construction arms. You can also find a fire extinguisher element with the toys. This build was so much awaited by the fans. Its interchangeable arms, platform, robotic construction and extra accessories add more detail and fun in playing with the armor. However, we see a whitish blue color to activate ARC reactor in the movie but the build consists of ordinary yellowish LED which might disappoint some of the fans. This was such a simple detail for this huge company but also LEGO decided to go with ordinary LED without coloring. The body and the platform of the Avengers Infinity War the Hulkbuster: Ultron Edition come with rubber grips at the bottom which helps the toy to stand firmly. You can pose for as many poses as you saw in the movie but there is no joint in the knee of the armor hence, you cannot make the toy bend the knee. However, that might be also beneficial to make the toy more stable. There would have been so many other factors to consider to make the toy stable. There is a joint in the hip area so you can pose in a split position by bending the hip outwards. The toy might lean backward and forwards due to the weak joints in the ankles. We advise you to be careful while using those stickers which will leave a sticky impression on the toy. 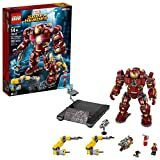 You can buy this outstanding LEGO manufactured Marvel Superheroes Avengers Infinity War The Hulkbuster: Ultron Edition on Amazon for one of the lowest prices. Amazon will directly ship it to your home and provides a justified return policy. The reviews and QAs on the product page will be very helpful to help you choose the best model of your Marvel Superheroes.